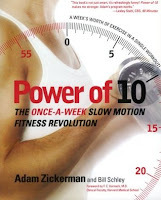 From Goodreads ~ Fitness expert Adam Zickerman presents a revolutionary exercise program – slow strength training – that will forever change the way people work out. The Power of 10 seems to contradict nearly everything we're accustomed to hearing about exercise. Forget hours on the treadmill and forget daily visits to the gym. This new program offers 20 minute workout sessions, once or twice per week, with an alluring emphasis on rest and recovery on your days off. The principle behind The Power of 10 is simple: by lifting weights in slow motion, making each rep last 20 seconds (10 seconds lifting and 10 seconds lowering) instead of the typical 7 seconds, you can maximize muscle transformation. The short workouts are so effective that your body will need days to recover and repair properly. Studies have shown that such routines can increase lean body mass, help burn calories more efficiently, and prevent cardio–vascular disease more effectively than aerobic exercise alone. 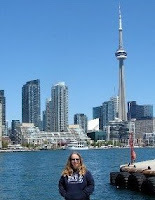 In 2004, I joined a gym, hired a trainer (Yvette, who is awesome! ), lost a bunch of weight and got healthy. Then Yvette moved to a gym in the east end of the city and I switched to a different gym closer to home in the west end. I wanted to keep up with weight training and eventually bought this book as it sounded similar to the principles that Yvette had been using with me ... heavy weights and slow reps.
Then life got busy, I got lazy and gained weight back. The book has sat on a shelf for years. The pages of my workout log are still tucked inside the book so I can see I used it about 15 times. Since July, I've been back on track and have lost 55.5 pounds (as of two weeks ago) with about 15 pounds to go. I feel that it's time to get back into weight training again (I've just been doing cardio). The principle behind this book is reducing the speed of each repetition to a cycle of 10 seconds up and 10 seconds down, with no rest between. According to Zickerman, when you slow down repetitions, your muscles are forced to work harder, unable to rely on momentum to propel movement. And because your movement is less jerky, the risk of injury is reduced. When you can't do another rep, you keep pushing for another 10 seconds to ensure muscle fatigue. The routines are clearing explained and there are pictures of every exercise in the routines.